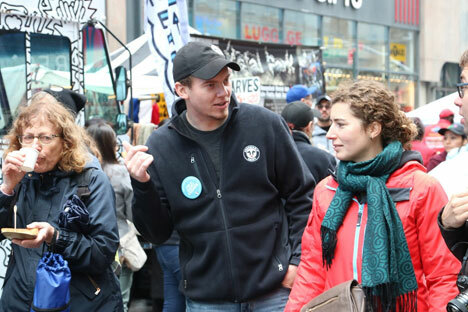 Two Wisconsin dairy farmers leveraged the connecting power of food to share their dairy story with over 10,000 consumers in the center of New York City this month. Elkhorn dairy farmers Laurie Kyle and her son Hayden of Kylecrest Holsteins and Jerseys represented Wisconsin as 21 dairy farmers from across the nation brought dairy to life at the Grand Central Food Festival and the Times Square Expo. The two events are part of the yearlong Undeniably Dairy campaign to unite dairy farmers and consumers, supported by checkoff dollars from Dairy Farmers of Wisconsin and Dairy Management Inc. The farmers connected with consumers by sharing their dairy story with people including families, working millennials, business people and curious visitors from around the globe. The experience gave consumers a lens into the day-to-day lives of farmers and the devotion they have for their career. The excitement over farm-to-table is not brand new, but people are increasingly embracing the movement. A recent survey showed that consumers trust farmers and more than 70% of people think it’s important to get to know the farmers who grow the food they eat. The Kyles captured visitor attention with their dairy story while teaching people about farming through a barn-themed interactive experience. The Undeniably Dairy food truck attracted curious attendees where a chef and dairy farmers shared chocolate milk and grilled cheese sandwiches. A 5-foot-tall “Connect Four with a Farmer” game fueled conversation about nutrition, sustainability and cow care. About Dairy Farmers of Wisconsin: Funded by Wisconsin dairy farmers, Dairy Farmers of Wisconsin is a non-profit organization that focuses on marketing and promoting Wisconsin’s world-class dairy products. For more information, visit our website at wisconsindairy.org.